The ideal combination of energy efficiency and luggage capacity. 28% powergain = ca. 9% speedgain. Data from SRM-measurements. Weight 3 kg (replaces carrier/bags/fender and tailfairing, so appr. 1 kg. lighter). Hardly longer than the bike itself. Go well prepared on a bike holiday with the most energy efficient or fastest bike in the world! Energy consumption at 40 km/h only 175 Watt! Compare: hybrid bike with luggage at same speed demands an energy-input of 850 Watt!! Not only for the M5 Low Racer but for the Shock Proof too, a Tail Bag is available. A useful accessory for transporting luggage. Available in carbon/epoxy or glass/epoxy version. Weight: 2.0 (carbon) to 2.8 (glass) kilogrammes. 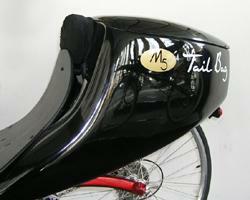 The Tail Bag replaces carrier, set of bags, fender and tail fairing, which leads to a lower net weight of your bike.